In a mixing bowl, combine the jalapeño, lime juice, cilantro, breadcrumbs, egg, mayonnaise, salt and pepper, and mix well. Gently fold in the crab meat until blended and the mixture holds together. Using your hands, shape into six 3-inch cakes, about 1-inch thick and somewhat flattened on the top and bottom. Set a large 12-inch skillet over medium-high heat and add the butter and oil. When the butter begins to foam, add as many crab cakes as will fit without crowding. Cook 2 to 3 minutes per side. The outside should be lightly browned and the inside cooked, but moist and firm when pressed with a finger. Remove the crab cakes from the pan. For the jalapeño aioli: Place the jalapeño, lime juice, mayonnaise, cilantro, salt and pepper in a blender or food processor and puree until smooth. For the garnish: In a medium bowl, mix the watercress with the lime juice and olive oil. Season with salt and pepper and toss. Aw thank you so much, Angie! Have a very Happy New Year, Bobbie! Gracias Pati, this looks like a great recipe. My husband is excited for me to prepare these. Abrazos siempre. Hope you both love the crab cakes, Dolores! You are my most favorite chef ! I think you’re a very gooswith all your instructions, sometimes I’m not sure about the names of spices you use in your food ,I would like for PBS,to write the ingredients beside your on the screen as I watch you make your recipes. You are such a sweet lady and you have such a wonderful family . Thank you so much! I hope you enjoy the cookbooks! Pati!! You are outstanding-your wit, knowledge, warmth…I can’t say enough nice things about you. Thank you for choosing to do what you’re doing-it means the world to many!! I am Mexican-American and am hoping one day to make all of these wonderful recipes for my family. I started tonight with the recipe of the week- Crab Cakes-what a delight!!! So tasty and decadent. I was hoping to see you in Nantucket this weekend (we reside north of Boston) but can’t pull it off this time-soon, for sure!! Thank you again! Jetta thank you so much for your message. It means so much to me! These look great! I cant wait to make these! I am watching this episode now on @create and wanted to get the recipe to print out …I wish this web page had a “search” bar, took me a bit to find it, bummer …hopefully it can be added. I love watching your shows! trying them tonight with my own twist…. we’ll see how my addition works! Haha! I like that, Leslie, thank you. Hola Pati, mucho gracias for the Crab Cakes with Jalapeno Aioli. I was a personal chef and caterer for years and have been cooking since a very small child. I come from a family of accomplished cooks, and my son is a schooled chef. Your crab cakes are wonderful and your jalapeno Aioli is incredible. I direct many people to Pati’s Mexican Table on PBS and also to your website. You are a ray of sunshine! The Crab Cakes with Jalapeño Aioli is fantastic!! So easy to make, too. This recipe will grace our supper table for years to come. Thank you! Drooling over your Crab Cakes with Jalapeño Aioli. This meal will be on our dinner table this coming week. YUM! Love your show! 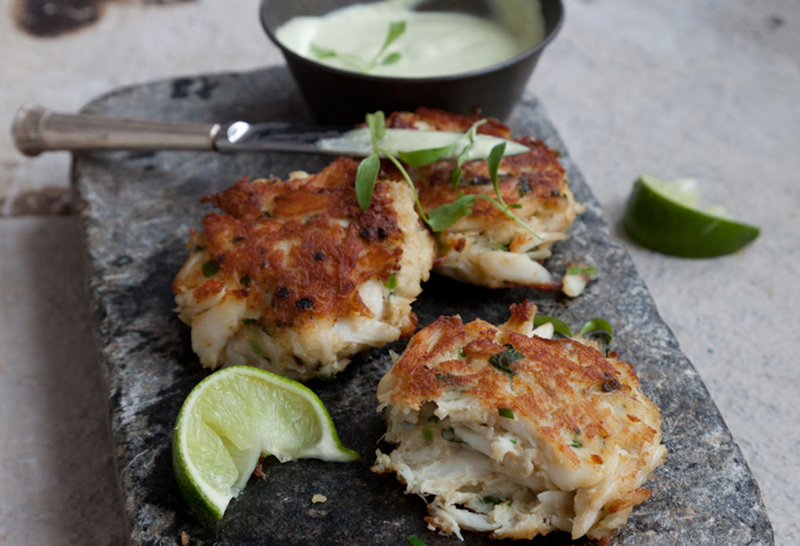 These crab cakes look amazing, I can’t wait to make them. In a blender, add the onions, black pepper, salt, cumin, and garlic and mix at medium speed adding water. Pour the blender mixture into the beef mixture. Form into 10 oz burger patties by hand. Cook burger to desired temperature. Heat buns in oven at 350 F for 5 minutes adding butter to the bread. Assemble burger: start with the base of the bread and layer the lettuce, slice of tomato, sliced onions, cooked burger patty, pepper Jack Cheese, cooked bacon, chipotle mayo and top of bread.